How much extra will I have to pay for the Contact Lens Professional Fees? Depending on your prescription, out-of-pocket fees can vary greatly. Please feel free to give us a call at (505) 883-2550 and visit with one our helpful receptionists. We will be able to help you determine a ball park figure on your out-of-pocket expenses. You will need to have an annual exam to keep your contact lens prescription up-to-date. Most vision insurance plans cover a routine eye exam. This exam is done to determine your eyeglass prescription and the health of the eye. 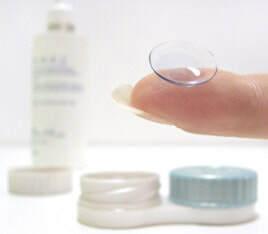 Contact lens services are separate procedures that are not covered entirely by insurance. What are Contact Lens Professional Fees? Contact Lens Professional Fees cover the extra time and testing the doctor and staff take to fit you with contact lenses. These fees also cover follow up visits and trial contact lenses, used to finalize your prescription. Your eye doctor will look at your corneas under a microscope to check for corneal conditions which can occur from dryness, allergies or over wearing your contact lenses. Other tests including a corneal topography are done to determine the prescription for your contacts. The results of this test provide a better fit of contact lenses as well as giving the doctor information about the health of the cornea. A corneal topography is a crucial part of your contact lens exam.